Carl Hester completed an unprecedented weekend for the British dressage team by adding a second individual silver to Thursday's team gold. After finishing second in Saturday's Grand Prix Special, the Sark rider replicated that result in Sunday's Grand Prix Freestyle with 84.179%. 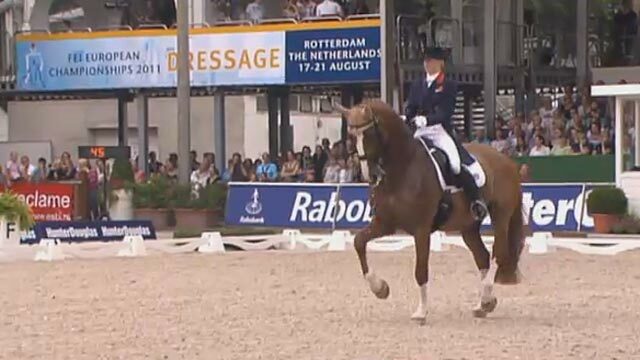 Dutch rider Adelinde Cornilessen, who won Saturday's Grand Prix, was again a cut above the rest with 88.768%. Britain's Laura Bechtolsheimer was edged into fourth with 82.946%. "It was the first time I'd ridden [to the music used] and somehow we arrived in all the right places at all the right time," said Hester, who praised his 10-year-old stallion Uthopia. "Six weeks ago he suddenly found a new gear and after Hickstead I knew we had to get serious and get new music. "For such a young horse to do what he did here I couldn't be happier with him, it's so exciting." Bechtolsheimer, who competed on board Mistral Hojris, said: "I'm so proud of him that he was so cool and focused. "It felt like one of the best music tests he's done; maybe the marks didn't quite reflect what I felt but it's still been an amazing show for British dressage. For Carl to get another podium finish is fantastic." Hester and Bechtolsheimer's team-mate Charlotte Dujardin, competing in her first-ever Grand Prix Freestyle competition with Valegro, was ninth. The trio, joined by Emile Faurie, won Great Britain's first European team title on Thursday with a European Championship record score.